Did you know that kale and chocolate both rank in the top 5 most nutrient dense foods on the planet? Per calorie, kale has more iron than beef, and more calcium than milk, it’s high in vitamin A (300% daily recommended value), C (89% daily value) and K (1,000% daily value), anti-inflammatory properties and antioxidants, is believed to help lower cholesterol, help with detoxification, and contains 10% of the recommended daily omega-3 intake. Read more about this awesome green here and here. So kale keeps you healthy, and chocolate, naturally, makes you fall in love. Chocolate raises serotonin levels, provides magnesium, improves blood flow, lowers cholesterol and blood pressure. Just don’t mix your dark chocolate with regular cow’s milk because it negates the antioxidant benefits. I use almond milk in the smoothie for this reason and for taste, and haven’t read anywhere that almonds inhibit the absorption of chocolate’s nutrients. 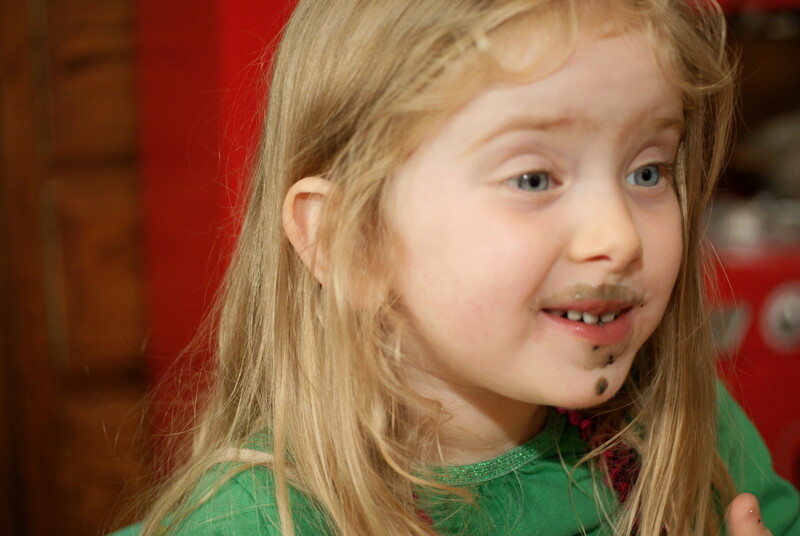 I created this recipe because my 3 year old loves dark chocolate but is not likely to chow down on a full serving of kale if served for dinner, so a smoothie felt like a promising way of delivering this powerful grow food, and anything containing chocolate is automatically viewed a “treat”. She asked for thirds, so we’ll be making this a lot in the future. Create a healthy addiction in your life…start making more smoothies! 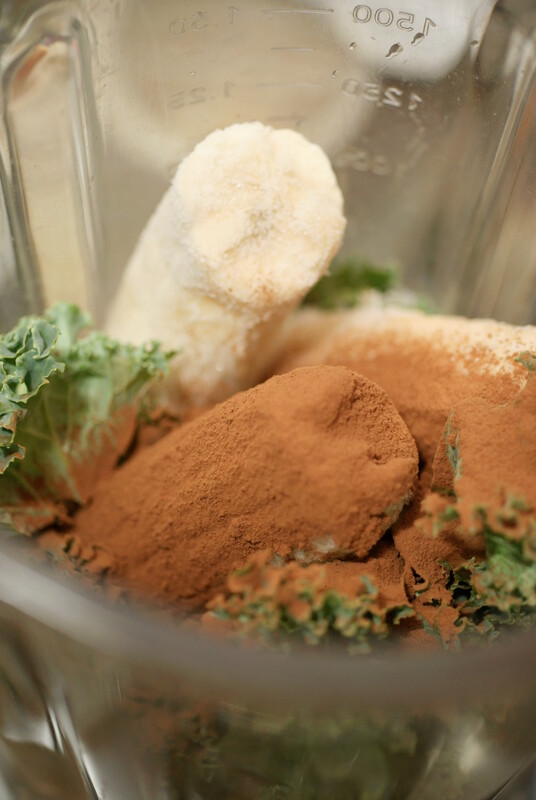 Combine all ingredients in blender and process until smooth. 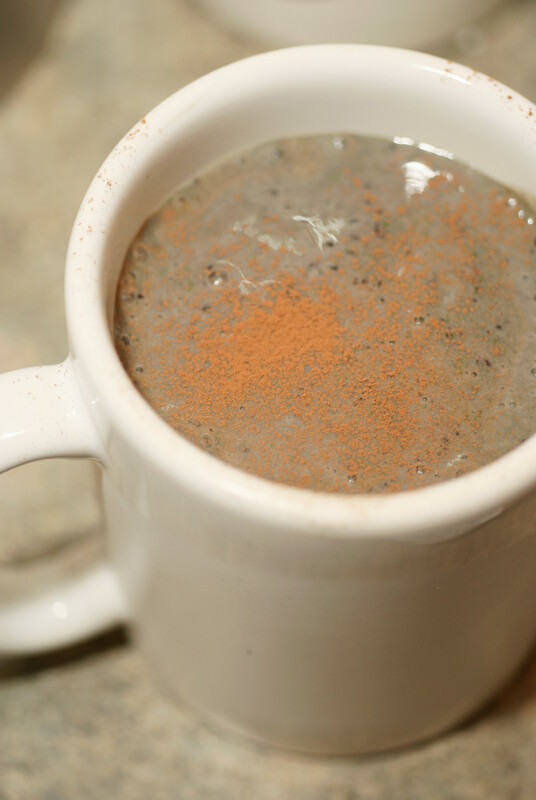 Pour into glasses or mugs and sprinkle with sifted cocoa. Serves 2-3.